Released July 6th 2016, Pokemon Go is the new hot app on the apple store and play store. 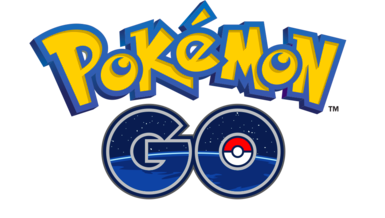 Pokémon GO is built on Niantic’s Real World Gaming Platform and encourages players to get outside and walk around. It uses real location similar to a GPS to guide players to Pokemon and Pokestops so that they can collect, evolve and battle with their Pokemon. 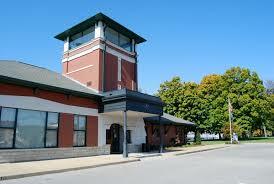 Popular with young children, teens and adults, it’s the perfect opportunity to explore Henderson, KY. Downtown Henderson is loaded with Pokestops, which are places where player can receive bonuses in the game. There are also other great places around Henderson that are worth visiting while Pokemon Hunting. While exploring, remember to look up from your phone screen and enjoy the real world around you. Here are 10 places (no particular order) in Henderson we suggest exploring while you are Pokemon hunting! 1.) The Henderson County Tourist Commission(101 N. Water St.)– Not only are we a Pokestop, but the Train Car behind us is one and the Post Office across the street is another. The Lewis and Clark in Kentucky Gym is also located right here. When you stop make sure you come in and say hello! We have maps and brochures of Henderson and surrounding areas along with Henderson merchandise and Kentucky for Kentucky merchandise. 2.) 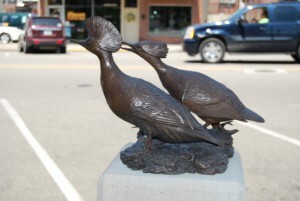 Audubon Sculptures (Downtown Henderson)- There are 16 Audubon Sculptures around Henderson. Many if not all of them are Pokestops. 13 of the 16 sculptures have hidden details on them so make sure to look up and try to find them all. Audubon Sculpture Walking tour guides can be found at the Henderson County Tourist Commission or dowloaded from https://www.hendersonky.org/wp-content/uploads/2013/10/AudubonBirdTour_2013.pdf. If you follow the walking tour and visit the sculptures you are sure to find many Pokemon and come across several other Pokestops. 3.) John James Audubon State Park (3100 US Highway 41 N.)– The entrance to this majestic park just happens to be a Pokestop, but why stop there. Hike the trails and search for more Pokemon while enjoying the park. Walk along the lake and take a chance to see the newly added wetlands.Trails and statues within the park also serve as additional pokestops. 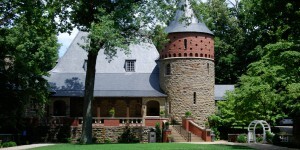 The John James Audubon Museum houses the largest displayed collection of John James Audubon memorabilia in the world. 4. 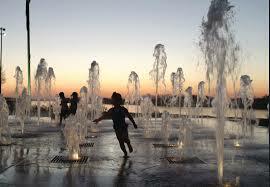 )Riverfront Fountains(Water St. and 3rd) – Let’s be real, walking in the summer gets hot. The Redbank Riverfront Military Memorial Pokestop is located behind Henderson’s interactive water feature. Large splash fountains are a thrill for children to run through and cool off while smaller fountains offer fun to toddlers and infants. 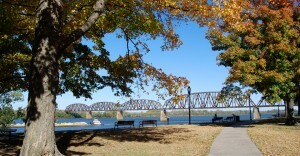 This location is the ideal outlook of the Ohio River and a marvelous place to watch the sunset. These fountains are located near Sunset Park where the River Park Gym may be found. 5.) 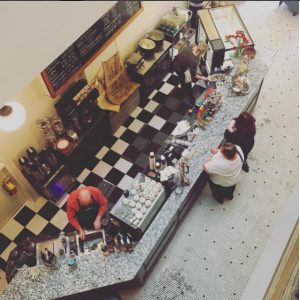 Planter’s Cafe and Coffeehouse(130 N. Main St.)- After your exhausting adventures, you will need to refuel at this convenient Pokestop. This current cafe and coffeehouse was built to resemblance a fortress to emphasize security for it’s original use as a bank. The original atrium has been restored. 6. )Riverwalk/Atkinson Park(Water St. and 5th)- Starting at Redbanks park and walking to the “Riverwalk” sign near the hospital you will discover several Pokemon stops. Continue on and you will discover a gym in a gazebo along the riverwalk along with another Pokestop at the volleyball court in Atkinson park. Venture past the playground and the skate park and rest of the riverwalk will reveal a few more Pokestops. You just have to walk along the trail. This trails offers the perfect view of the riverfront and takes you past playgrounds, picnic areas, baseball fields, disc golf, the skate park, and so much more so take a break from the screen and enjoy nature. 7.) 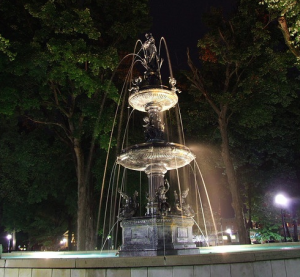 Central Park(Center of Washington, Main,Elm and First streets)– Placed at memorials and the enormous fountain(erected July 25, 2003), Pokestops are abundant at Central Park, located in the heart of downtown Henderson. (More than 5 Pokestops at this park) Central Park is a gorgeous place for a picnic or to take selfies as you journey through Henderson. Central Park is believed to be the oldest municipal park west of the Alleghenies. 8.) 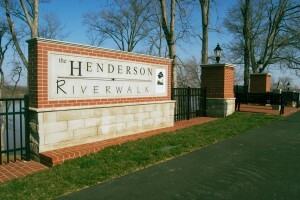 Audubon Mill Park( Second and Water St.)-Right beside the Henderson Tourist Commission, lies the park where John James Audubon attempted to establish a retail business. Some of the original stones from the foundation of his mill are still visible at the park. Two Pokestops await you and so does the sunset as this park provides the perfect elevated outlook on the mighty Ohio River. 9.) 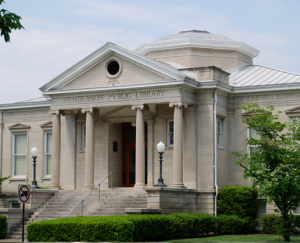 Henderson County Public Library(101 S. Main St.)-The oldest public building left standing in Henderson was built with a $20,000 donation from Mr. Carnegie and the Carnegie Foundation. Many art exhibits are displayed in the Rotunda which has walls adorned with murals depicting Greek muses of art,science, music and literature. The library serves as a pokestop and also has an Audubon sculpture in front that is an additional Pokestop. The Library is located across from Central Park as well and is down the street from the pokestop at the Henderson Fire Department. 10.) Downtown Churches/ Historic Buildings– While traveling around downtown be on the look out for historical plaque markers and churches. Both tend to be Pokestops. 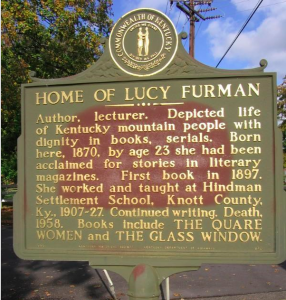 If you come across a historical marker read about the building or site which you are at. It’s always a great opportunity to learn something new and be able to share the knowledge with friends and family. If you would like to know more about buildings you see along your journey pick of a Historic Downtown Henderson Walking Tour Brochure from the Tourist Commission. Pokemon Go can be a great chance to see and learn about the community as well as walk around to get exercise. It’s always more fun with friends and family. Document the places you go with pictures and selfies and use #hendersonky on social media and your photo may be reused with proper creditation of course. Remember to be safe and alert of your surroundings. Enjoy the real world as you explore a virtual one. Please do not cause traffic obstructions just to catch Pokemon and always be respectful of private properties. Enjoy Henderson KY as you get up and go with Pokemon GO!